Mosquitoes are nasty little buggers – and not just because they’re annoying and cause irritating bites. Mosquitoes are especially awful because they transmit diseases like chikungunya, dengue, encephalitis, filariasis, malaria, West Nile virus, and yellow fever. 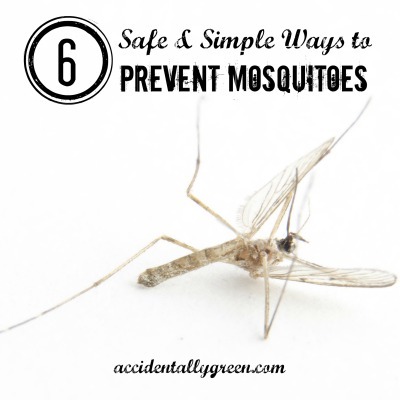 It’s also important to prevent mosquitoes – if you don’t have as many mosquitoes buzzing around, you’ll reduce your chances of getting eaten alive. 1. Eliminate standing water. If you have any outdoor spaces, be sure to check your bird baths, buckets, gutters, kids’ toys, old tires, pet bowls, planter saucers, recycling bins , swimming pool covers, tarps, or wheelbarrows. 2. Keep your grass trimmed. And whack your weeds! 3. Try to be as artificially unscented as possible. Mosquitoes are attracted to the scent of perfume, sunscreens and fabric softener. 4. Stay in a breeze or close to a fan , if possible. 5. Avoid using incandescent lights and candlelight at night. How do you prevent mosquitoes? Follow Hilary Bernstein’s board Bye Bye Buggies! on Pinterest. Today I’m linking up with Richly Rooted. plant some lavender and rosemary around your garden. mosquitos hate those. when doing campfires you can burn some dried sage in it to keep mosquitos away and it smells great. I love these tips, Lydia!